These days going to the gym is very popular. Everyone is trying to lose weight, bulk up or get toned. The more people that are in the gym, the more I see people doing stupid things which at best won’t help them reach their goals and at worst can lead to injury. Here is list of some of the things I have seen recently at the gym which are stupid to do and won’t work. 1) Every time I go to the gym I see this. 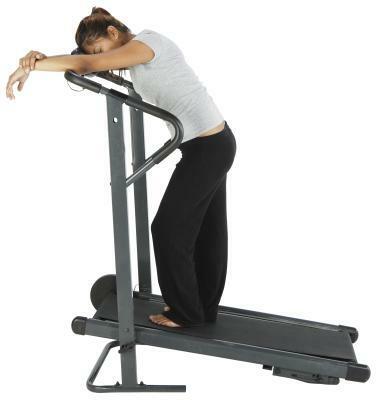 A person will set the treadmill to maximum incline but then hold on to the handles for dear life. Holding on eliminates the benefits of putting the treadmill on an incline in the first place. 2) All too often guys will try to lift too much because of their ego and they want to impress their friends. Unfortunately their form suffers and they don’t make much if any progress. One of the particularly dangerous ways of doing the bench press incorrectly is bouncing the bar off their chest as the bar comes down. When you bounce the bar off your chest you get additional momentum from the bounce making it easier to get more reps per set. Unfortunately this is no better for you than lifting with proper form but slightly lower weight. To make matters worse you could break a rib or your sternum if you come down too hard. I saw a guy repping 315 lbs. on the bench a few days ago who was bouncing the bar off his chest. While it was impressive that he could lift so much, 315 lbs could easily break your sternum if you lose control. 3) Another way I see a lot of people mess up with their bench press form is not letting the bar go down low enough. Instead of lowering the bar to their chest and just barely touching their chest, they stop when their arms are at a 90 degree angle and the bar is still 8 to 10 inches above their chest. This is a pointless exercise and doesn’t even work your chest. The bottom half of the bench press is mostly a chest exercise and the top half of the bench mostly exercises your triceps. If you only bring the bar down half way then you are doing an exercise for your triceps and not your chest. What do you see at the gym that is stupid or doesn’t work? In my mind, THE top waste of time at the gym can be seen in the mass of “uncommitteds”: those performing an exercise (bicep curls, bench presses, leg presses/extensions…whatever) with such ease, such nonchalance, that not even a whiff of exertion or real “work” is achieved. As if “just showing up” at the gym is the goal. If you’re not pushing past a certain “level of comfort”, inflicting a minimal amount of trauma to muscles, you’re pretting much wasting your time. Sure, you’re expending a little energy… but you hardly need a gym membership for that. On the other hand: seeing someone grimacing with strain, “in the moment”, cursing under their breath to get a “couple more in”… very motivating! yes, i see people on the 30% incline treadmills holding on all the time and it pisses me off because I want to use that treadmill but they’re always full with holders basically letting the treadmill drag them along. If they just reduced the speed they could actually let go and benefit from a nice climb. Also, the people on the stair master who are hoisting up there bodies by locking in their elbows, holding the sides with most of their bodyweight supported by the machine, and just lifting their legs on to the next rolling step rather than lightly placing their hands on the center grip for balance and lifting their own body weight up with each rolling step. Improper form also takes the focus of a lift off of the muscles that you are trying to work and disperses it to other muscles that you have to use to compensate for the weight being to heavy. This makes the exercise less effective and you will build less muscle. It’s not about how much weight you lift, but how you lift the weight. That is great info, thanks for commenting.